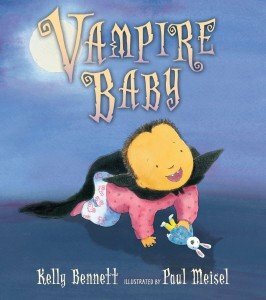 Vampire Baby by Kelly Bennett with illustrations by Paul Meisel from Candlewick Press. Don’t let her nuzzle your neck!! 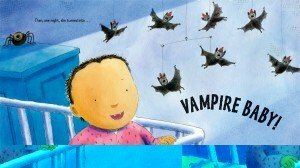 The old adage, “Don’t judge a book by its cover,” came to mind when I first saw Vampire Baby (Candlewick Press, $15.99, ages 3-7) . With Halloween right around the corner, it’s the perfect book for all of the little monsters in your life, yet it’s SO much more. Together author Kelly Bennett and illustrator Paul Meisel offer comic relief to the sometimes sensitive new-sibling-on-the-scene situation (in this case blood sucking’s the issue rather than rivalry), give it a new twist and take the bite out of a biting baby. Tootie, like most newborns, is an adorable, chubby-cheeked baby. She coos and gurgles and captures her big brother’s heart. When Tootie gets her first teeth, (which happen to be upper canines), develops a widow’s peak, favors red foods, and bites everything in sight, her brother is convinced she is a vampire baby! He wastes no time trying to find Tootie a home with a vampire family. However Brother sees red when Tootie is yelled at by the new family’s vampire boy after she has bitten his nose. Only then does he realize that even if she is a vampire baby, she’s his vampire baby. from Vampire Baby written by Kelly Bennett. 3 lucky winners could receive a free signed copy of Vampire Baby + swag. Just LIKE our Good Reads With Ronna Facebook page, then follow instructions below on how to enter. 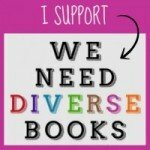 This great giveaway from Kelly Bennett ends 10/31/13. 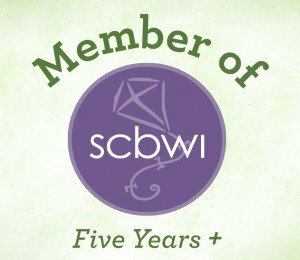 Prizes include an autographed copy of VAMPIRE BABY by Kelly Bennett for your little ghost or goblin – along with fun VAMPIRE BABY swag such as a bookmark, postcard, and fangs. 3) You’re entered! It’s just that easy!! 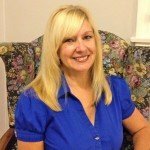 Today’s guest reviewer, MaryAnne Locher, majored in education and went on to teach pre-school before having children of her own. 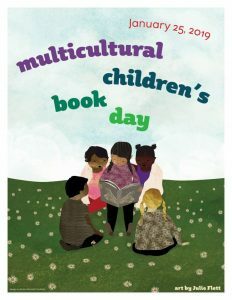 As a young child, she would create picture books to popular songs, then read them to her family. Now that her two daughters are grown, she has again pursued a career in writing. A New Jersey native, MaryAnne now calls Southern California home.